← “Tunisian Crochet for Baby” book winner! It’s time to get ready for winter and what better way than by crocheting a new scarf! 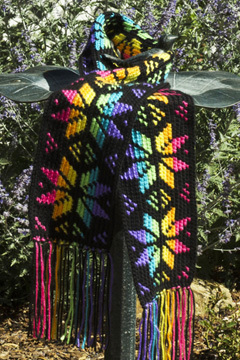 Here, for your crocheting pleasure, is the newest scarf pattern at The Crochet Architect: our “Stained Glass Snowflake Scarf”! This scarf may look complicated, but it’s not. It is worked in rows of single crochet, all on the right side with color changes. There are long tails at the beginning and end of each row to turn into the fringe when you’re all done crocheting this beauty! And we all know what that means, right? NO TAILS TO WEAVE IN!!! Do I hear a “hallelujah”? As you can see, the afghan and scarf look very much alike, except the afghan has more rows of snowflakes and the scarf has more snowflakes wide (10 snowflakes, to be exact). They’re made the exact same way, which makes it nice. If you like my snowflake afghan and are intimidated by its size, why not try making the snowflake scarf instead. Then when you have the confidence, you can move up to making the snowflake afghan! The snowflake afghan pattern is available on the Mainly Crochet website here. 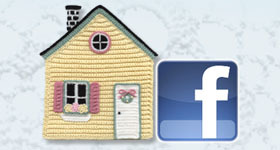 If you haven’t heard of Mainly Crochet, it’s a digital crochet magazine that is available to subscribers. You can get all the information about their service on their website. So what types of projects are you going to crochet this fall/winter? 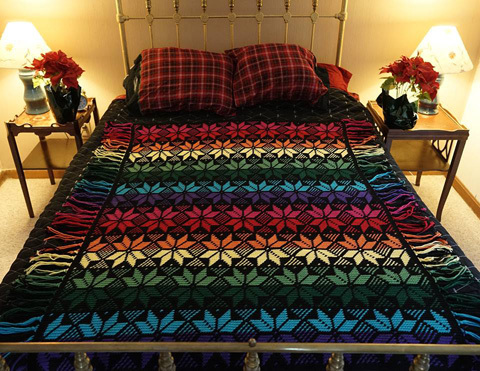 Are you going to make some afghans or scarves? How about a sweater? It’s a lot of fun to crochet new projects and give them as gifts (for those recipients who appreciate them, of course!). 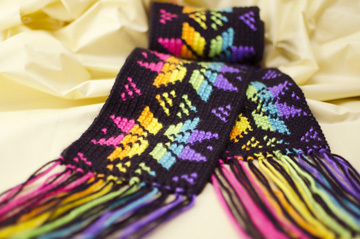 To purchase the Stained Glass Snowflake Scarf pattern, just check out our “patterns” page! This entry was posted in Crochet patterns, Crochet Scarf, Crochet websites and tagged crochet patterns, crochet scarf, published design. Bookmark the permalink. It’s beautiful, and yes you have my hallelujah! Thank you. I’m glad you like it! I always enjoy projects with NO ENDS TO WEAVE IN!! !